Break the chocolate into pieces and put into a small saucepan with the measured water and a few tablespoons of the milk. Heat gently, stirring, until the chocolate has melted. Add the remaining milk, stirring to blend. Melt the butter in a pan, add the flour, and cook, stirring, for one minute. Remove from the heat and gradually add the chocolate and milk mixture. Bring to a boil, stirring, until the sauce has thickened. Stir in the vanilla extract and caster sugar, and leave to cool. Beat the egg yolks into the cooled chocolate mixture. Lightly butter the individual soufflé dishes and set aside. Whisk the egg whites until stiff but not dry. Stir one large spoonful of the egg whites into the chocolate mixture, then carefully fold in the remainder. Divide the mixture among four 300 millilitre soufflé dishes. Place on a hot baking tray and bake in a preheated oven at 190°C/gas mark 5 for 40 to 45 minutes until the soufflés are well risen and firm. Dust with sifted icing sugar. 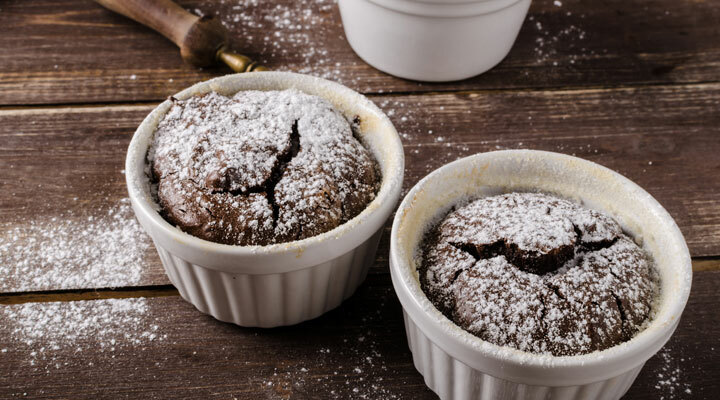 Serve the soufflés at once.